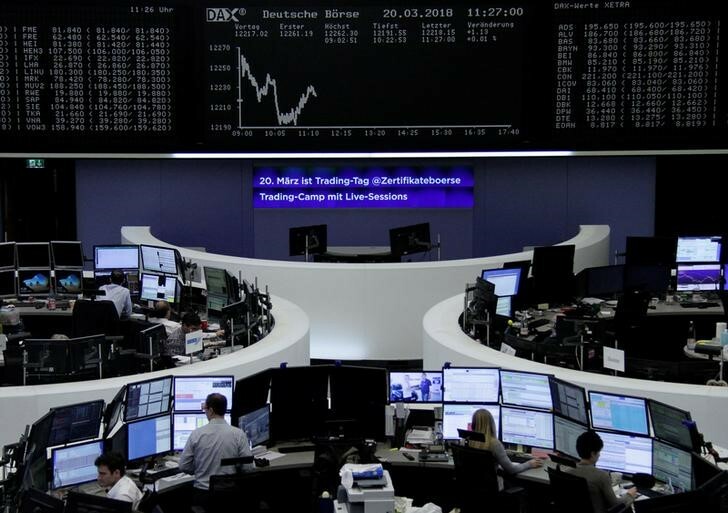 LONDON (Reuters) – Strong financials stocks and better-than-expected euro zone economic data helped drive a bounce in European shares at the end of a tumultuous week marred by trade war worries. The pan-European STOXX 600 (STOXX) and its euro zone counterpart (STOXXE) were set for their biggest weekly loss in three months as the realities of rising global protectionism sank in, particularly for the autos sector. The STOXX climbed 0.5 percent by 0830 GMT, while Germany’s exporter-heavy DAX (GDAXI) rose 0.3 percent. Euro zone private business growth recovered in June and grew faster than expected, but manufacturing growth was the weakest in 18 months on trade worries, a PMI survey showed. The better euro area data added to stronger figures from Germany and France to boost European benchmarks. Banks drove the lion’s share of gains after the 35 largest U.S. banks cleared the first stage of the Federal Reserve’s annual stress test. U.S. subsidiaries of Deutsche Bank (DE:DBKGn), Credit Suisse (S:CSGN) and UBS (S:UBSG) easily met all the minimum capital requirements. The European banks index (SX7P) climbed 1.2 percent, with UBS, Credit Suisse, Santander (MC:SAN) and HSBC (L:HSBA) among the biggest boosts. Deutsche Bank topped the DAX with a 1.4 percent gain. “Despite the recent negative press headlines concerning Deutsche Bank’s U.S. operations, the U.S. IHC reported post-stress ratios well ahead of the minimums and a stress deterioration broadly in line with peers,” said Goldman Sachs (NYSE:GS) analysts. There remained signs of trade war anxiety, however. Autos stocks (SXAP) extended their losses, down 0.4 percent and the worst-performing sector. They sank on Thursday after Daimler (DE:DAIGn) warned profits would be hit by Chinese tariffs on cars imported from the United States. The autos sector index was headed for its worst week since the sell-off at the start of January 2016. In single-stock moves, BPER Banca (MI:EMII) led the STOXX, jumping 6.4 percent after Unipol (MI:UNPI) raised its stake in the Italian regional lender. “Within the context of high local political uncertainty which has weighed on government bonds and in turn on bank shares, this transaction could provide downside protection for BPER shares in the short term, notably as Unipol could still acquire another 5 percent of BPER,” said GS analysts. It helped the Italian banking sector (FTIT8300) recover some of Thursday’s losses as heavyweights Unicredit (MI:CRDI) and Intesa Sanpaolo (MI:ISP) also rose. Overall, concern over a weaker economic picture and Italian politics has driven previously enthusiastic investors out of the European equity market, with tens of billions of outflows over the past three months. “We are noticing revisions for earnings and GDP in Europe which are pretty negative, as opposed to the more positive revisions from the U.S., based on earnings growth but also clearly on tech stocks,” said Eleanor Taylor Jolidon, co-head of global and Swiss equities at UBP in Geneva. Europe’s lack of “Big Tech” stocks to match Amazon (NASDAQ:AMZN) and Facebook (NASDAQ:FB) has held it back and hampered its relative earnings growth.